UNDERDOGS Greetland showed great character to hit back from 2-0 down and beat Sowerby Bridge 3-2 in last night’s Jack Haymer Challenge Cup final at the Shay. A wonder goal from Bridge’s Jordan Bedford, whose first-time effort from 40 yards out near the touchline floated into the net, looked to have settled the Halifax AFL’s showpiece game of the season. However, the introduction of experienced substitutes Karl Jowett and Michael Midwood approaching the final quarter changed the game. Jowett got Greetland back into the contest just a couple of minutes after coming on, Tom Wall made it 2-2 with a stunning 25-yard volley and Jowett struck again in the closing seconds to settle matters. Both clubs were bidding to lift the trophy in memory of key club members. Greetland club captain Chris Green died of a heart attack aged only 37 after a county cup match in Huddersfield late last year while Bridge have lost stalwart Dave Culpan and posted pictures of him on their dug-out last night. Leonard is the Arsene Wenger of the Halifax AFL. He has been at the helm for 15 years and his side save their best for the knockout competition. It was his fifth trip to the Shay and the third time his side have lifted the Challenge Cup. He admitted he had been fearing the worst after Bedford’s spectacular effort five minutes after the break but that the introduction of Jowett, who he said no longer had the stamina for 90 minutes, had made a big difference. Bridge had won the two earlier meetings in the Premier Division and they made a flying start, prolific marksman Damien Watkins needing no second invitation to bulge the net after a lightning three on two break following a corner. 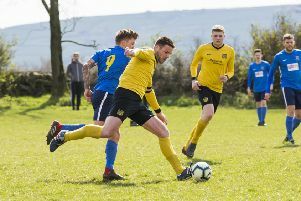 Bridge played the neater football in an open contest, with Luke Maguire and Tom Hiley to the fore, but Greetland’s raft of tall players meant they were always likely to be a threat from set pieces. Charlie Cliffe was thwarted by Bridge keeper Jordan Bolton after good work from Wall while Bridge striker Lee Wood weaved his way past two defenders close to half time but Craig Taylor blocked his effort. Bedford’s goal, after Taylor had come out of goal to help clear, doubled Bridge’s lead but Greetland, with man of the match Dave Walker keeping Watkins quiet and making numerous clearances to keep his side in it, finished the stronger. Jowett’s quick, tricky running troubled a tiring Bridge defence in which Ryan Brook had tidied up well, while Midwood’s hold-up play added control. Jowett’s precision finish from Jordan Winter’s ball in made it 2-1 on the hour. Bolton then got his hands to Wall’s excellent strike but was unable to stop the ball hitting the roof of the net 11 minutes later. The scales had tipped Greetland’s way and the Winter-Jowett combination delivered for them again late on with the latter pouncing at the back post to complete the turnaround. Greetland: Craig Taylor, Ben Cole, Oliver Bagley, Dave Walker, Adam Worsick, Charlie Cliffe, Aaron Dorward, Matty Oldfield, Jordan Winter, Jonny Crowther, Tom Wall. Subs: Karl Jowett, Adie Ford, Jack Deighton, Michael Midwood, Micky Conroy. Sowerby Bridge: Jordan Boulton, Ben Hiley, Joel Cleary, Ryan Brook, Kai Hadley, Tom Hiley, Martin Bates, Luke Maguire, Lee Wood, Damien Watkins, Jordan Bedford. Subs: Chris Stanton, Daniel Jennings, Sam Hiley, Andy Markham, Adam Barlow.